We will try and make every effort to help you locate it. We love the Jeepin lifestyle and hope to share a little of our bit of the Jeepin life with you. Philosophy - AskAJeeper is a place where Jeepers and Jeepin People can go to get all the information they want. Jeep Wrangler (JK) (2007-2017) w/ Hard Top; Kit Contains Various Seals to Repair Leaks; Used in conjuction with Mopar TSB #23-001-07 and 23-025-08. Hard Top Seal Kit Fits. 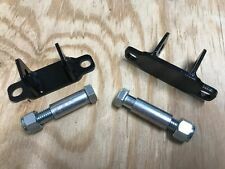 JEEP XJ TJ & JK Wrangler Upper Rear Bar Pin Eliminator Kit. Fits all 97-06 TJ Wrangler's, 07-17 JK Wranglers, and 84-01 XJ Cherokees. "Crown Leaf Spring Shackle --. Notes : Shackle Kit without Bushings; Provides 3/4 in. of Lift; 5-1/2 in. from Bolt Hole to Bolt Hole; Includes 4 Plates and Hardware. Jeep owners throughout the world trust in Crown’s performance parts and accessories to enhance their adventures. 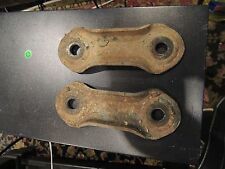 Crown Automotive RT Off-Road part number RT21023 is a set of leaf spring shackle plates for 4 springs. 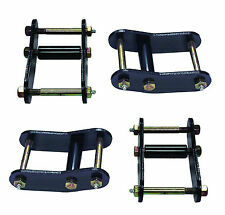 The kit includes eight (8) shackle plates, bushings, and installation hardware. This heavy duty shackle kit is designed to improve the performance, durability and look of your suspension. The shackle plates and reinforcement sleeves are finished in a black powder coat. 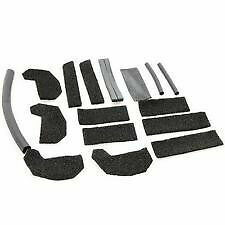 This kit will effectively lift your vehicle 3/4". The plates are made of heavy duty steel construction. Installation instructions are included with the kit. Get ready to enjoy a new level of performance by using a heavy-duty leaf spring shackle kit by Rugged Ridge, designed to enhance your driving experience and get a little lift without costing an arm and a leg. Here we have a set of rear leaf springs from a Jeep Wrangler. This was (J88) a 1988 wrangler. This jeep sat well but as you can see there is rust on the springs and one has a small crack shown in the pictures. We will beat any price! 1987-1995 Jeep Wrangler (YJ) 4WD. 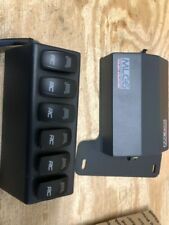 Part Of Pro Comp Lift Kit: K3061B. Spring Type: Leaf. Leaf Spring Width (in): 2.500 in. All ride height increases are approximate and will vary due to vehicle specifications. Here we have a nice set of rear leaf springs from a Jeep Wrangler. The part # on the bottom is RPN20X these are the 5 leaf set. Storks Auto Jeep parts 610-488-1450. 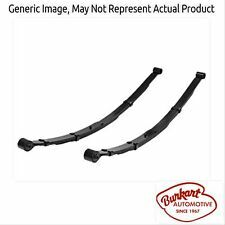 Pro Comp 51423 Rear Leaf Springs 4" for 1987-1995 Jeep Wrangler (YJ). 1987-1995 Jeep Wrangler (YJ). These are great springs for the money for my Jeep YJ they ride stiffer than the factory Springs they were very easy to install went right into all the factory bolt holes. 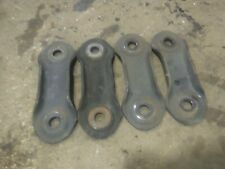 1 GOOD USED SET 4 MAIN SPRING EYE BOLTS, THESE WILL FIT 87-95 JEEP WRANGLERS. 87-96 Jeep Wrangler YJ. New in the box! Energy Suspension 22107G front or rear OEM leaf spring bushing kit for. This kit contains 12 bushings for 1.25" ID spring eye and 6 steel sleeves 3" long with. 56" ID hole. Quantity sold : Kit. Notes Includes Brackets, U-Bolts And Shackle Kits, Location : Front. Notes : Front; Includes Brackets, U-Bolts and Shackle Kits. Location : Front. Condition : New. Therefore all implied warranties that may apply to your part are limited to the duration of this written warranty. 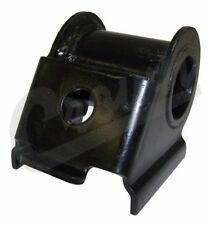 Crown Automotive Leaf Spring Assembly part number 52003448 is the 4 spring assembly for the front of the Jeep Wrangler. 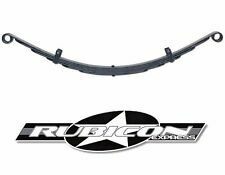 The leaf spring assembly has the same specs as the factory spring for easy installation.